A Barnsley Historian's View: It's all in a phrase ... "Work Related Activity"
So here's the decision, it landed on my doormat a few hours ago. 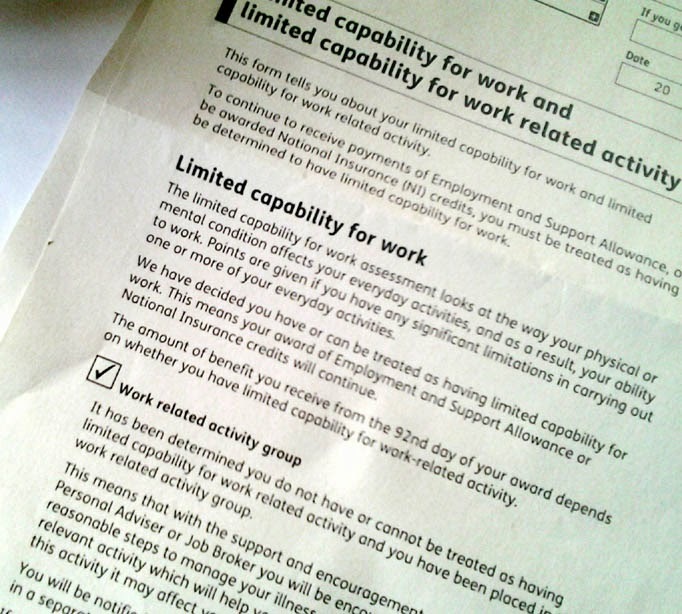 Officially for the next eighteen months the DWP have deemed that I "have limited capability for work" and my claim for Employment Support Allowance or National Insurance credits will continue. The decision - it's complicated! There's a machine printed tick in the box before the heading "Work Related Activity Group". The judgement is "you do not have limited capability for work related activity and you have been placed in the work related activity group", that's the WRAG. Get used to that acronym I'll be using it a lot for the next year or so. I have limited capability to work .... but I do NOT have limited capability for work related activity. The DWP and ATOS accept that I can't work at a regular job, BUT in their eyes I am fit enough to take part in some work related activity that they will decide. Sorry, but did I misunderstand? I'm not fit for work! you said so! and yet you are expecting me to attend the Job Centre, waste the time of some poor 'specialist personal advisor' and undertake goodness knows what other kind of 'relevant activity' you might throw in my direction. Note to DWP - I have been ill since 2003, my last day in full time work was in 2009, I have had nothing but doctors' appointments, consultants appointments and tests and test and tests ever since and I am not going to get any better! Recently I had another colonoscopy and a gastroscopy and a CT scan and none of them were good news - it wasn't 'the end of the world' but it wasn't a New Dawn either. I will be ill like this for ever! My friends have just been suggesting on Facebook that I look into part time teaching or some other self employment - I am trying to establish myself as a Local History speaker, but somehow I think that the four, expenses only, bookings I have got so far for 2014 aren't going to do any more than start to repay the OH for the nice shiny leaflets he had printed for me. I can't commit to teaching, I tried that, I can't guarantee to turn up to a regular session, I will inevitably fall foul of something or other and end up spending a week in bed and another couple of weeks being dodgy, just like I did last month and I'm only just coming out of it now. 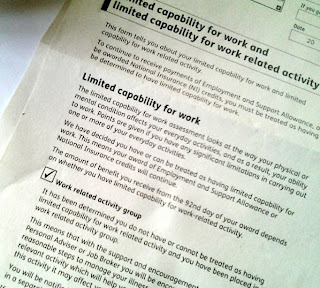 If I don't participate in the activities the DWP specify it "may affect your Employment and Support Allowance". That's my NI credits actually, I haven't had any ESA for over eighteen months as the OH (my other half) works full time. So presumably if I'm ill on one of the days I have to go and be 'active' that will count against me rather than prove that I'm actually too ill to work - oh, dear it's all a bit too complicated and circular. What if I give it all up and don't bother to attend? - I probably have enough NI credits for my pension by now - I will completely fall off their statistics and they'll be able to crow about another scrounger who has been found to be claiming a benefit they weren't entitled to. Errm ... I'll just reiterate - YOU - the DWP - have just agreed AGAIN I have 'limited capability for work'. Why do I have to keep proving it? I do prefer self-employment to the eternal condemnation of JSA/ESA as it enables me to manage my condition properly and stay as well as I can. As for NI contributions, you can get a statement of where you are with them from the DWP. If you're self-employed and earning beneath a certain threshold, you can choose whether to pay NIC or not by applying for a Small Earnings Exemption. However I choose to pay them because if I don't, I won't get a full State pension. I haven't actually earned enough to pay tax or NI since 2004 and it's easy enough to keep the relevant records. I don't have to worry about declaring income to the DWP, nor do I have to attend anything I don't want to or can't. There are plenty of paid genealogists who will research family history for a fee, I'm sure you'd be a good addition to their ranks!